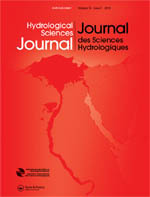 Hydrological Sciences Journal provides a forum for original papers and discussion of significant developments in hydrological science and practice, and related disciplines. The current Impact Factor is 2.061, and the Five-Year Impact Factor is 2.274. Institutions and libraries should order direct from Taylor & Francis: www.tandf.co.uk/journals/thsj, or their usual agent. Special journal subscription rates are available to IAHS Members: £27.00 for a personal online subscription, and £48.00 for a personal online + print subscription (£32.40 and £53.40, respectively for EU members, inclusive of VAT). IAHS Members should order here or contact info@iahs.co.uk. Access to the back archive is free - explore 61 volumes of cutting-edge research and discovery.